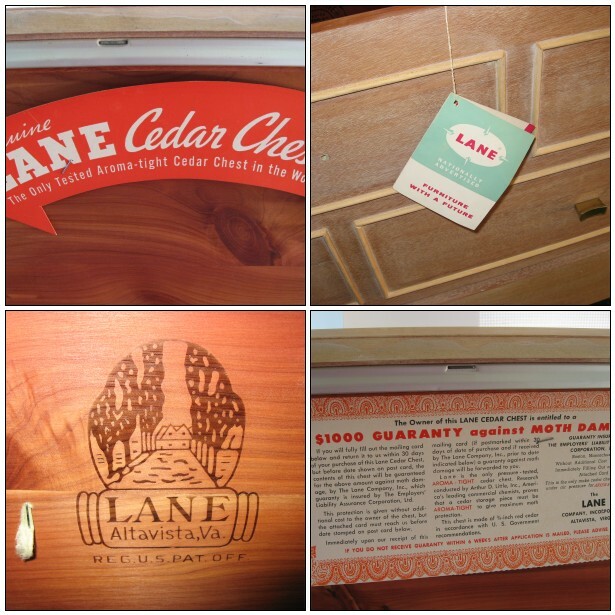 Awhile back, as in a few years ago, I happened upon an awesome mid-century Lane cedar chest while out thrift shopping one day with my husband. Chances are your mother or grandmother had a cedar hope chest that she received as a graduation or other special occasion gift before she was married. At first glance I thought it was a dresser and then realized it had faux drawers. This particular model was made in 1957 according to the serial number stamped on the back. It even still had the original hang tag and labels inside. 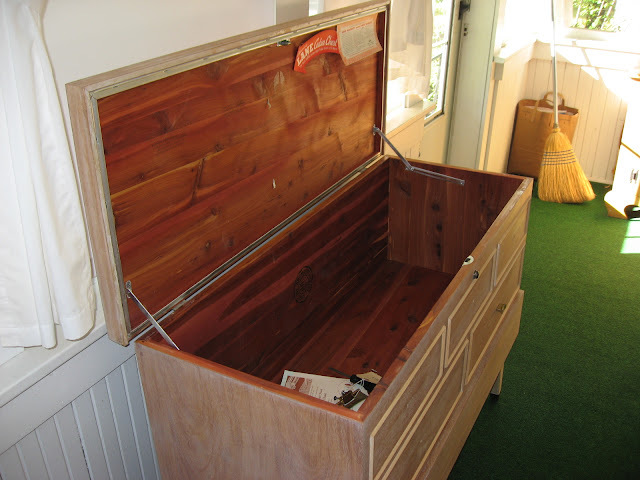 I'd never seen a cedar chest quite like it. I immediately fell in love with its sleek lines, but it had definitely seen better days. 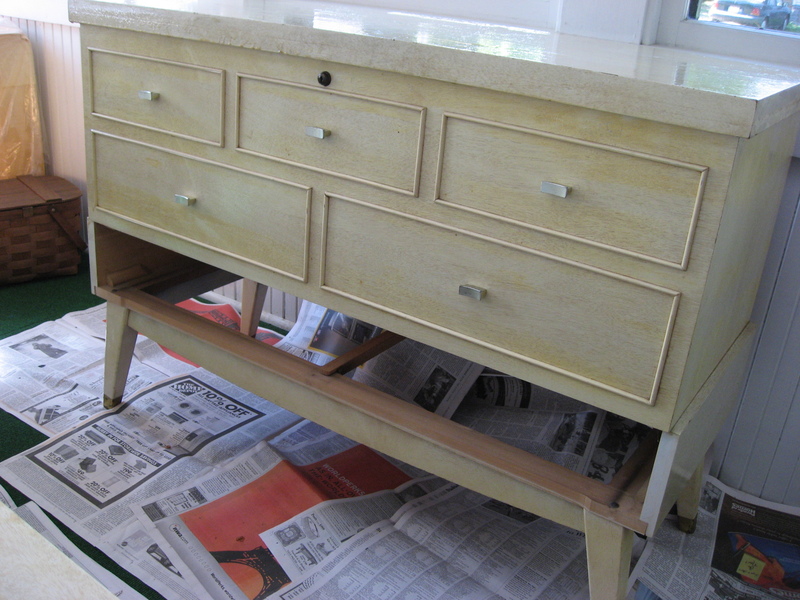 Its yellowed and grungy blond finish was pretty hideous, with stains and water marks. I had absolutely no place to put it in my little house. I could see its potential but I was ready to be firm and walk away. That's when my husband said those magic words: "Get it. If you don't you know you'll regret it. And if you come back it'll probably be gone." Well, what's a girl to do? A willing partner, the brawn to help move it and we just happened to have the van with us. Sold! Original finish ready for stripping. So, this future beauty came home and we tucked it in a corner of the front porch because there was no other place for it. I still had resale in mind for the finished project anyway. And there it sat for a few months while I explored my options. Should I paint it? Strip and stain it? I finally decided I'd strip it and see what it looked like. I could always paint it if it didn't work out. It took a couple of go rounds but all that horrible blond finish came completely off leaving a nice clean veneer. There was no lifting or damage to the veneer whatsoever, much to my relief. Stripped, lightly sanded and ready for finishing. Once it was cleaned up I decided I really rather liked its bare looks. If I were doing it now I probably would have just sealed it and left it kind of rustic like that. But at the time I was thinking about stain. 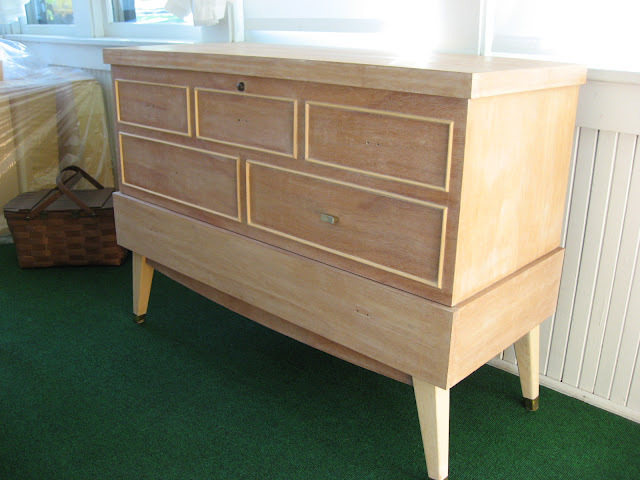 However, the little wood strips that make the faux drawers were a different type of wood than the rest, a bit lighter, as were the legs. I wasn't sure how the whole thing would take to stain. Would it look even or blotchy? So I did what I always do, which is to think about it. Put on my Queen of Procrastination crown and let it ripen on the front porch for another year. Finally, after that time had passed, in one of my rare moments of just-do-it-already, I changed my mind and slapped some primer on it. Bam! Decision made. Now what color to paint it? Something light? Neutral? What color? Aaargh...I don't knoooow. I can't decide! In the meantime I cleaned all the drawer pulls and spray painted them with some ORB (oil rubbed bronze). Months more of indecision go by. Finally, FINALLY, after all that angst I ended up painting it__white. I know! I'd gotten used to the looks of it sitting there with its white primer. There's just a tint of gray in the white which I really like, as opposed to a creamier white that I've regretted using on some other furniture. Once we moved the computer out of our bedroom there was finally a place for it too. It would be great storage for our winter sweaters and my yarn stash. It would be, except it's full of my Etsy inventory instead. I needed a safe place to keep the more fragile items until I figure out something else, a cupboard in the basement perhaps. I'm very pleased with how it turned out and haven't regretted painting it. This fifty-plus year-old cedar chest will hopefully have another half century of life in it. Oh, and one important safety note. 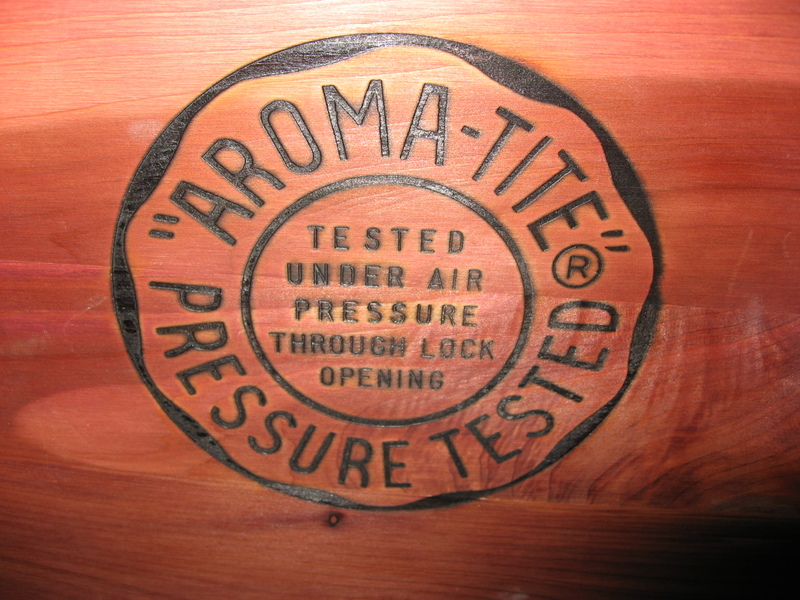 Some years back the Lane company had a recall on the latches for their cedar chests and trunk. 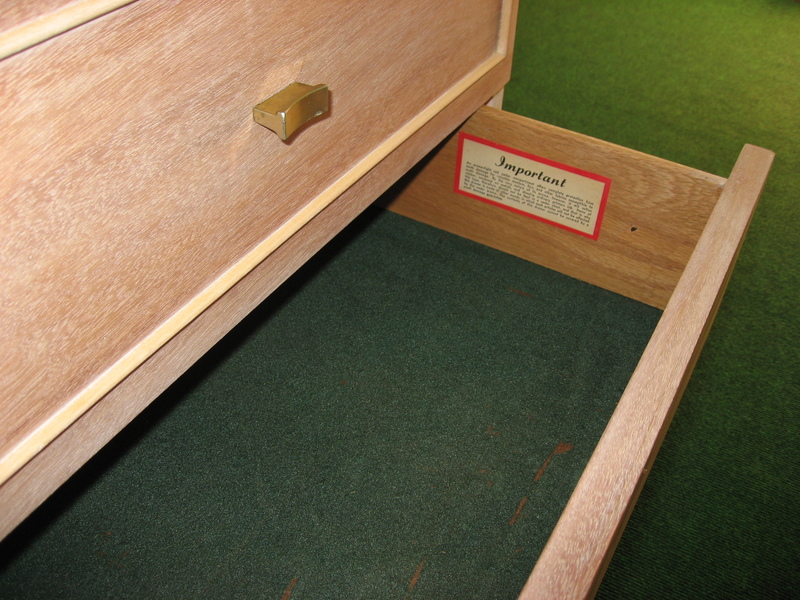 If a child were to climb inside, and the lid be closed, the lid would latch shut and couldn't be opened from the inside. 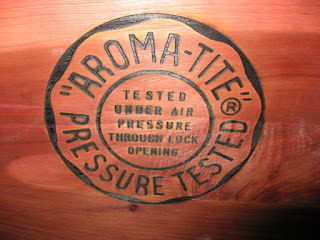 Since the chests are made with an "aroma-tite" seal there was a very real risk of suffocation. I was able to order a free replacement latch and lock through Lane's website. That crochet afghan on top of the chest is another one of my favorite thrift store finds. Whoever made it had a great eye for color. I love how the colors really pop against the black. It's very modern looking for a granny afghan and it's even made of wool yarn instead of the usual acrylic stuff. Here's a gratuitous close-up shot for you. Wow what a score! It takes me a while to figure out what color, what fabric, what rug, what anything. All the waiting and contemplating made for a beautiful chest. I love it! When I graduated from high school the girls received miniature Lane chests. What a beautiful piece of furniture! It looks great! I just bought an identical chest. Mine has a lot of damage so I'll definitely need to paint it-- it's so helpful to see what it looks like in white. Great job and thanks! I found the exact chest at salvation army for $39.99. Can't believe it! Where did you find those great pulls??? Wow! That's a great price, Amy. Finds like that are what keep me acquiring more projects than I should really be taking on. The pulls are original to the chest. I've seen other styles on chests like these, so I'm guessing they either offered options or maybe changed the production run periodically. Hello! Found this great post when I was looking online for ideas to help my similar chest. May I ask how you stripped the veneer? Turned out GREAT! Thanks KC. I used a citrus based gel stripper that is non-caustic. I had to do it a couple times, carefully using a putty knife to scrape it off once the finish was bubbled. Then I used a textured pad like you'd use for non-stick pans, with a little more stripper, to clean the final residue off. A very light sanding was all that was needed after that.